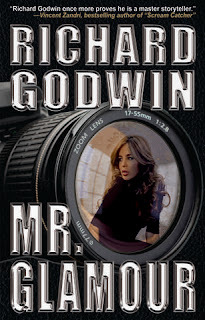 Richard Godwin stopped by to give us a tantalizing peek at his latest novel, Mr. Glamour. Hope you're hungry--the feast begins now! Designer goods, beautiful women, wealthy men, a lifestyle preyed on by a serial killer. A killer who is watching everyone, including the police. Latest headlines? Now Black Jackal Books have published Mr. Glamour, and I'd like to tell you a bit about it. The settings are exotic, and the pages drip with wealth. The story's told in my usual style, and my readers will know what that means. I have been told I write with a blend of lyricism and graphic description. I like to explore what motivates people and I certainly do so with the leading characters in Mr. Glamour. The two central cops, DCI Jackson Flare and Inspector Steele, are unusual and strong in their own ways, as reviewers are already picking up. At the beginning of the novel Steele hates working with Flare for personal reasons. She doesn't by the end, and the investigation takes them both on a journey which changes them and their opinions of one another. Something dark is preying on the glitz of the glamour set. There is a lot about designer goods and lifestyles in Mr. Glamour. The killer knows all about design, he knows what brands mean to his victims. He is branding their skins. And he has the police stumped. As Flare and Steele investigate the killings they enter an exclusive world with its own rules and quickly realise the man they are looking for is playing a game with them, a game they cannot interpret. The killer is targeting an exclusive group of people he seems to know a lot about. The police investigation isn't helped by the fact that Flare and Steele have troubled lives. Harlan White, a pimp who got on the wrong side of Flare, is planning to have him killed. And Steele has secrets. She leads a double life. She is an interesting woman who pushes her sexual boundaries in private. She travels a journey into her own past and rescues herself. And in a strange way she is helped by the killer she is looking for. And Flare has some revelations in store. As they try to catch a predator who has climbed inside their heads, they find themselves up against a wall of secrecy. The investigation drives Flare and Steele to acts of darkness. And the killer is watching everyone. Contrasting this lifestyle is the suburban existence of Gertrude Miller, who acts out strange rituals, trapped in a sterile marriage to husband Ben. She cleans compulsively and seems to be hiding something from him, obsessed that she is being followed. As she slips into a psychosis, characters from the glamorous set stray into Gertrude's world, so the two plots dovetail neatly with one another. "Richard Godwin knows how his characters dress, what they drink and what they drive. He knows how they live---and how they die. Here's hoping no one recognized themselves in Godwin's cold canvas. Combines the fun of a good story with the joy of witty, vivid writing." -- Heywood Gould, author of The Serial Killer's Daughter. "Smart, scary, suspenseful enough for me to keep the light on until 3AM on a Sunday night, Richard Godwin once more proves to fans of crime fiction the world over with Mr. Glamour, that he is not only one of the best contemporary writers of the procedural cop thriller around today, he is a master storyteller." -- Vincent Zandri, author of Scream Catcher. "Richard Godwin's top-of-the-line psychological police procedural driven by its heady pace, steely dialogue, and unsparing vision transfixes the reader from page one." -- Ed Lynskey, author of Skin In The Game. "Mr. Glamour is a striking effort from one of the most daring crime writers in the business. It is the noirest of noir...and hellishly addictive." -- Mike Stafford, BookGeeks Magazine. "This first rate detective thriller will have you gripped from the start. Richard Godwin is an author not to be missed." -- Sheila Quigley Author of Thorn In My Side. "Mr. Glamour is, in every sense of the word, the real McCoy: genuine hard boiled detective fiction. Lean, gritty, and tough, it's a journey into the heart of darkness...you won't soon forget. 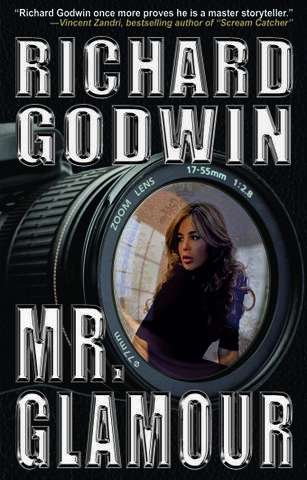 Connoisseurs of Nouveau Noir will have to add Richard Godwin to the list of writers to watch!" -- C E Lawrence, author of Silent Kills. "This is one outstanding novel written by one amazing author." -- Fran Lewis Review. I think Mr. Glamour will appeal to mystery and crime afficionados, to readers interested in psychological profiling and designer lifestyles, to thriller and noir fans, and to anyone who enjoys a fast paced narrative with strong characters. I can't wait for my copy of Mr. Glamour to arrive. If you haven't read Richard's novel Apostle Rising yet, what are you waiting for? Here's a couple of links for you to use to get it right now. You don't even have to leave your seat. Also, here's a link to my review of Apostle Rising. Richard's stories are fascinating, terrifying, mysterious, and will surround you with a palpable darkness that will have you peeking over your shoulder as you turn every page. What more could you possibly ask for!